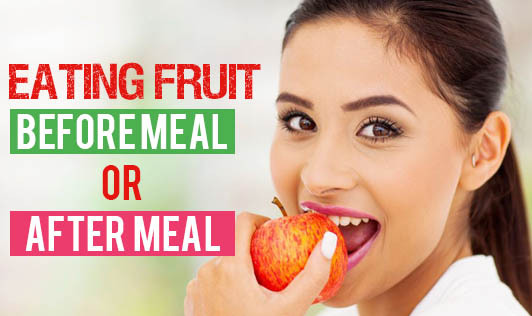 Eating Fruit - Before Meal Or After Meal? 2 days ago, I received an email describing the best way to eat a fruit. It talked about why fruits should be eaten on an empty stomach and how diseases can occur if fruits are eaten after a meal!!! I'm surprised that this email is still doing the rounds; I had received a similar one some years ago and replied to that person that the information was utter rubbish. How can fruits eaten after a meal cause toxins in the body and food putrefy in the stomach? There's absolutely no scientific basis for this information. If this were true many of us should have been diseased by now!!! Human body secretes enzymes of different types which are capable of digesting a variety of foods and nutrients, no matter when they are eaten. Fruits can be eaten either at the beginning or at the end of a meal or between meals. So, go ahead and enjoy your fruit as a dessert or as a filler.